A bit of delayed justice. 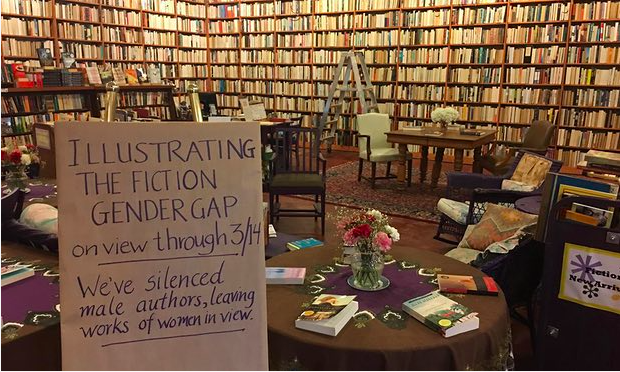 Loganberry Books in Cleveland, Ohio, is turning the status quo of literature inside out for Women’s History Month this March. Throughout the store, countless books line shelves with their spines against the wall and their pages facing outward, making it impossible to know what the books are and who wrote them. At first glance, it might appear like some weird act of vandalism. But a closer look reveals a pattern — only books by female authors have their spines in view. Books by male authors, on the other hand, can’t be spotted. It’s subversive symbolism and a bit of delayed justice. For all the centuries of overt and implicit censorship of female writers and voices — books by women reflexively rejected by editors and dismissed by critics, categorized and marketed in demeaning ways — Loganberry Books is flipping the script to silence male authors. The staff of Loganberry spent hours turning more than 10,000 books of fiction around. Patrons will still be able to find a great book — after all, women write great books. But as they’re browsing the store, they’ll also get to reflect on how many women have been censored throughout history, and the amplified attention men have received as a result. The Brontë sisters wrote as Currer, Ellis and Acton Bell. Mary Ann Evans wrote as George Eliot. J.K. Rowling used initials instead of her first name Joanne because her publisher wanted to “attract boy readers.” Since the dawn of literature, female writers have sought to escape negative gendered connotations by adopting male pseudonyms. Today, no marker is more emblematic of the sexism blocking women from critical acclaim than the “chick-lit” section found in many bookstores, implying that while male writers deal with broad human subjects, women only write for each other. Even the category “chick-lit” suggests something childish, frivolous, something beneath literature. Loganberry Books is sending a direct challenge to this common perception by showing how absurd it is when half of the population is denied an equal audience.